12 ft. Sq. 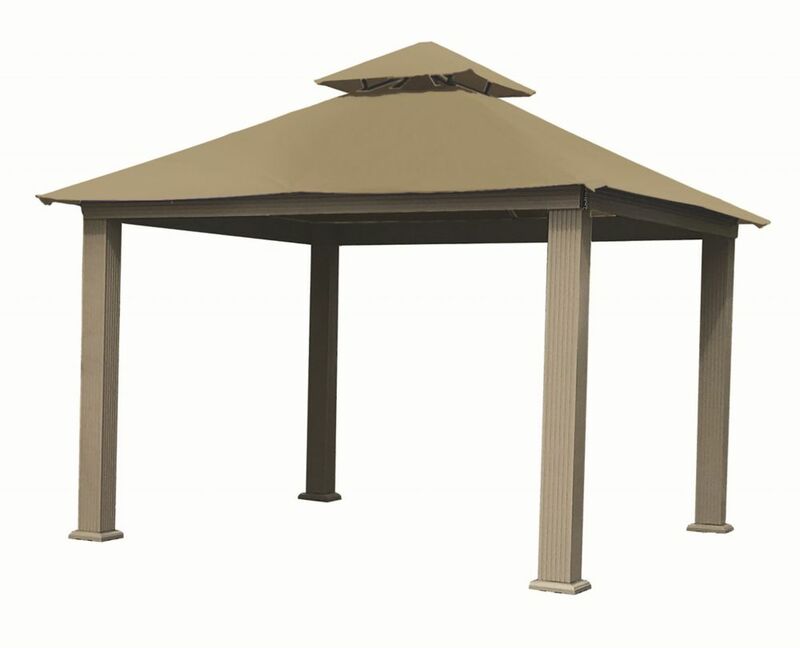 Gazebo -Khaki The ACACIA Gazebo program offers the enthusiast the ability to extend their covered living area. Our rust free Structural Extruded aluminum frame will last a lifetime. The Electrostatic finish makes the frame even more durable and attractive. The electrostatic finish actually sends an electric charge through the paint and the frame to help cause a chemical (ionic) bond, much stronger that simple powder coating commonly found in imported versions. From our quick assembly sculpted heavy-duty legs that can support over 1000 lbs. each to our unique frame design. We use Sun-DURA branded solution dyed polyester fabrics from Glen Raven Inc. Our factory precision laser cuts each of the canopy tops for the best fit. With 19 total colours available, we are sure that there is a colour to match your exterior and your needs. With a simple design, the canopy can be easily removed during winter months, extremely windy conditions, or for cleaning. 12 ft. Sq. Gazebo -Khaki is rated 5.0 out of 5 by 4. Rated 5 out of 5 by Dultzman1 from Very easy to assemble and very durable. This gazebo is a perfect size and looks great. I expected it to be very strong due to the aluminum construction. It is much stronger than I could have imagined. Rated 5 out of 5 by Shane from Amazing Very high quality and covers a large distance. It is also reassuring to see that the material is a very strong aluminum as I was worried of the snow load during the winter months. Rated 5 out of 5 by Sam from amazing! I have this over furniture in my backyard and it keeps the furniture in good shape and looks great. Rated 5 out of 5 by RegDunlop from Fantastic product! Great way to extend our living area and entertainment options. Quality mater... Fantastic product! Great way to extend our living area and entertainment options. Quality materials.